Particle devices are compact and easy-to-code hardware development kits that provide everything you need to build a connected solution. They combine an ARM micro-controller, a communication chip (WiFi, GPRS or 3G) and a web IDE with tons of community examples and libraries to get started quickly. Using the Particle IDE you can create different Apps to serve different purposes. A “New App” in Particle is simply the code configuration tool that gives your Particle hardware the programming it needs to send data, how to send data, when to send data, and where to send data. Creating a New App will allow you to program, using libraries, your Particle hardware to fit the IoT Solution you are building. In this guide we will explore how to create a New App in the Particle IDE, and also review the Command Line Interface (CLI) tool from Particle. Creating a New App is the first step required in sending your data to Particle before being forwarded on to Ubidots for data enhancement. PRO NOTES: If you are already a Pro in creating New Apps in Particle, proceed to the tutorial How to use Particle Webhooks with Ubidots to complete your integration of Particle hardware with Ubidots IoT App Development cloud-software. 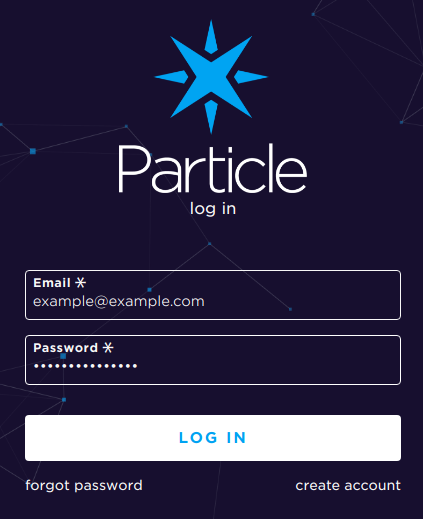 To begin, log into the Particle IDE with your Particle account. 2. 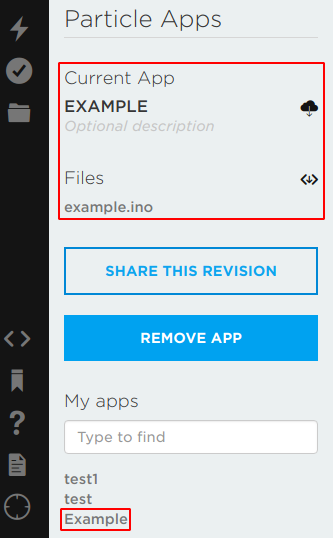 Then within the left sidebar, type the description or name you want to call your new App or programming. When complete, press Enter -or- press the "CREATE NEW APP" button. 3. Confirm the project has been created. Now, your device is ready to be programmed! There are two ways to program the Particle hardware. 1) The Particle IDE Web-platform and 2) The Command Line Interface. 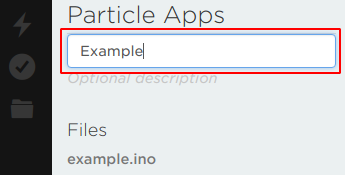 If you choose to code your New App using the Particle IDE Web-interface, simply skip the next section on CLI and proceed to the Device Connection articles located at the bottom of this guide. If you wish to create an App and code the device directly from your PC, see below for additional instructions. CLI is the way to manage Particle hardware's code and the devices from your command terminal. If you don't have the CLI tool installed on your PC please refer to Particle's guide to install CLI before continuing. Press enter to execute, give your New App a name, our example uses "Ubidots". Then, select "Yes" option for the default folder directory. Done! With this confirmation a New App has been created. To continue with the integration of your Particle device with Ubidots, please proceed using the below method that best fit your Solution's use case.